Hello Theodor, I see you are completing a CruZer as well. I have just scheduled my inspection for 9/19. Dynon recommends you buy their wiring kit for the servos, one for each servo. They're around $54 each. The come with 20' of wire. I found that 10' was more than enough. I bought one kit, cut it in half, and purchased the appropriate extra D-Sub connecters needed at a local electronics shop. The kit is easy. Comes with twisted wire pairs for the controls and straight wire for the power. Also extra pins, zip ties and such. I found the instructions that came with the kit were not as clear as they could be, but the instructions on page 286, or 10-12, in the System Installation Manual, told me everything I needed. As a start for the flap actuation from a stick mounted switch take a look at Bob Nuckolls Aeroelectric Book and in Chapter 11 there is a good basic diagram for the relays and connections for this. It is figure 11-7. I am not sure if this answers your question, but it is a good place to start. Fuel flow: The new ULPower ECU (I assume you have the Red one and not the silver/black one) provides a signal the Dynon EMS can translate. On page 40 of the ULPower installation manual (ECU Wiring Loom Cockpit), #5 describes 3 wires. The ULPower white/white wire connects to the Dynon EMS 37-pin harness pin number 32 (white green wire). The ULPower white/blue wire is unused. 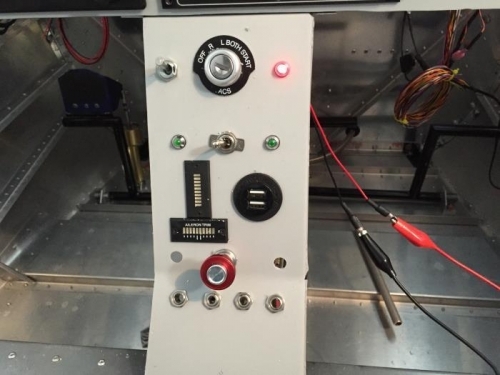 The ULPower white/red wire provides a pulses per liter signal that the Dynon EMS can be configured to decode. This wire should be connected to the EMS 32-pin harness pin number 14 (yellow wire). Because this method measures actual fuel consumed by the engine, there is no need for a return fuel flow sensor (red cube from Jon and Gus’ video). NOTE: I tell you all this having not actually run my engine. All I know is my wiring set up allows me to crank the engine, and the fuel pumps do run, but I have never put fuel into it yet. For your remaining questions, I mixed my replies in with your original text. 1) Is there a preferred method of connecting the small diameter wires to each other? None of which I’m aware. I’m not at my airplane right now, but as I recall, I grouped the either using 2-into-1 splices or by using 2-into-one terminal (ring or tab). 2) On page 40 of the UL Power DVD is says to pull all five ground wires together. Does this mean they stay together, or are they distributed further. Do they go the the aircraft ground to to the Composite Design UL Power? Mine are all terminated onto my single aircraft grounding block which is wired to the battery -. I combined the 5 wires into two tab terminals. Do these wires go to the Composite Design UL Power panel? I believe you mean the Composite Designs Power Panel? I don’t believe ULPower has anything to do with this product. Anyway, no, those wires do not go to the power panel - they go to the 20 amp switch as described above. 4) Is it possible to use Dynon wire lead to the oil temperature switch without a heat covering? I don’t see why not. I have a flame resistant wrap on mine, but only because it’s bundled with other wires and I wanted to keep them organized together and to protect the wires from possible zip-tie chafing. 5) I presume the items in number 6 also go to the Composite Design UL Power Panel. No. The white/green goes to the aircraft common ground or in my case the grounding block. The white/red wire isn’t used, so I have mine sealed off with shrink-wrap. I don’t use the white/blue either since my Dynon Skyview is set to warn me a low battery. And the white/white wire goes to the red LED light I installed next to my ignition switch as pictured in one of the links I provided above. Theodore - I have the Dynon Skyview and ULPower 350iS too. What functions are you concerned about?